After graduating with a Masters of Art from California State University, Fullerton, Beverly worked for several years in commercial art. Feeling the need to pick up the paint brush again, she began exploring the fine art scene in southern California. She started taking her paints outdoors and was hooked on painting directly from life. She developed her painting skills while working a full time job in graphic design. In 2009 Beverly relocated from Yorba Linda, CA to the bluegrass region in her home state of Kentucky and fell in love again with the beauty of the area. 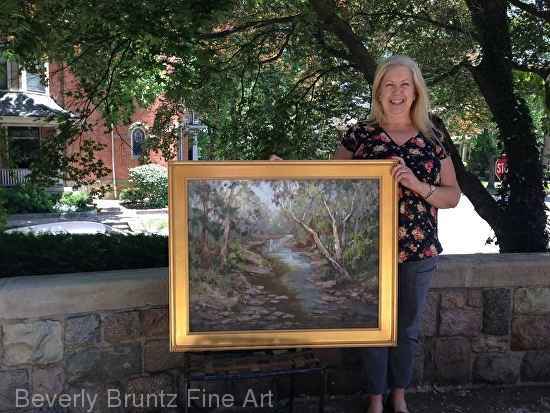 Primarily a landscape artist, Beverly is often drawn to paint outdoors. Her expressive oil paintings are meant to transport the viewer to ordinary places that evoke a sense of nostalgia. For inspiration she travels the backroads finding rural scenes and quiet spaces. Now living in the bluegrass region of Kentucky, she has an endless supply of subjects. While the subject of her paintings varies, it is the quality of the light that helps her narrow in on a particular scene. Each painting presents a new set of challenges. Beverly tries to hone in on the elements she can control and then lets the beauty of the moment take over. Putting down a quick block in allows her to capture the essence before the light shifts. Inevitably there is a surprise during the creative process. For Beverly, it is that element of spontaneity that motivates her to keep painting.